Today, August 2, 2013, PAGASA reported that a new low-pressure area (LPA) was estimated at 1,340 km East of Southern Mindanao issued at 5:00 am. There is no tropical cyclone existing within the Philippine Area of Responsibility (PAR). PAGASA weather bulletin issued at 11:00 am today, "the Low pressure area (LPA) Off Coast of Aurora is now estimated at 60 km Northeast of Calayan Island, Cagayan." PAGASA said, "Batanes, Calayan and Babuyan group(s) of islands will experience cloudy skies with moderate to occasionally heavy rain showers and thunderstorms which may trigger flash floods and landslides." 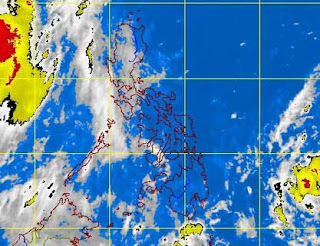 It added that the rest of the Philippines will be "partly cloudy to cloudy with isolated rain showers or thunderstorms." PAGASA said the southwest monsoon enhanced by Tropical Storm Jolina (international codename Jebi) together with strong to gale force winds may affect the western seaboard of Luzon. Thank you for reading this weather update, please kindly bookmark and visit this website regularly, like our Facebook page, follow us on Twitter, add us on Google+, and/or subscribe to our daily news feed via RSS or Email. Comments or suggestions about "PAGASA Weather Report Updates | August 2013" is important to us, you may share it by using the comment box below.